Character set identifiers for the character sets defined by Exif. Shortcut for a CommentValue auto pointer. Read the comment from a byte buffer. Write the comment in a format which can be read by read(const std::string& comment). Return the Exif charset id of the comment. Byte order of the comment string that was read. Value for an Exif comment. This can be a plain Ascii string or a multipe byte encoded string. The comment is expected to be encoded in the character set indicated (default undefined), but this is not checked. It is left to caller to decode and encode the string to and from readable text if that is required. The comment is decoded to UTF-8. For Exif UNICODE comments, the function makes an attempt to correctly determine the character encoding of the value. Alternatively, the optional encoding parameter can be used to specify it. 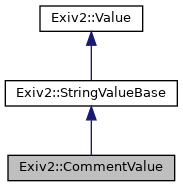 encoding Optional argument to specify the character encoding that the comment is encoded in, as an iconv(3) name. Only used for Exif UNICODE comments. A string containing the comment converted to UTF-8. Determine the character encoding that was used to encode the UNICODE comment value as an iconv(3) name. If the comment c starts with a BOM, the BOM is interpreted and removed from the string. Todo: Implement rules to guess if the comment is UTF-8 encoded. Read the value from a comment. The default charset is Undefined.